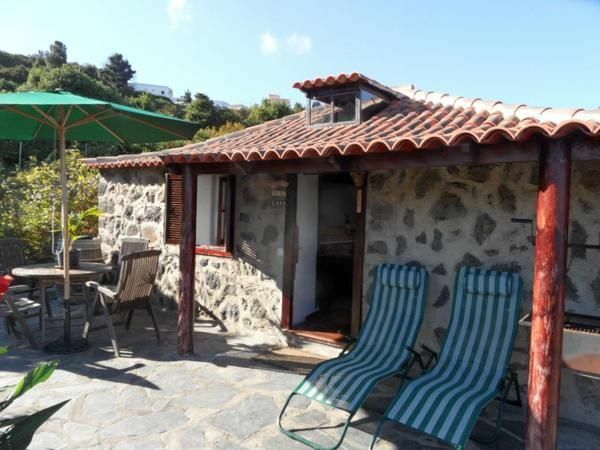 This country house is located in the town of Icod de los Vinos on the north east coast of the island of Tenerife and is surrounded by vineyards. The house with a living area of ​​45 m² can accommodate up to three people. It consists of a bedroom with a double bed and a combined living and dining area with a kitchen equipped with oven, gas stove, refrigerator and coffee maker. In the living area there is a comfortable sofa that can be easily converted into a sofa bed. The bathroom has a shower, toilet and sink. Prior to the villa there is a large terrace with garden furniture, a small garden and from here you have a beautiful view of the surrounding vineyards. In the distance you can see the sea and the highest mountain on the island, Mount Teide. The house is over 150 years old and in the restoration, special emphasis was placed on the preservation of the original structure. The owner lives in the same grounds. Its quiet location, guests can relax just fine here. The finca Cueva del Viento is located in one of the best areas of the island. Especially for nature lovers there are many opportunities. The place Icod de los Vinos is about two kilometers away. You should definitely watch the city's old town. These include a variety of churches, Plaza de la Pila, the Convento de San Francisco or la Casa de los Cáceres. Sehr schöne, einfache Finca in der Natur (Kulturlandschaft mit Wein, Brombeeren, Obst, Blumen, Eidechsen, Vögeln etc.) mit schönem Ausblick bis zum Meer und sehr nettem Vermieter. Leider war das Wetter nicht so sommerlich, wie wir uns das vorgestellt haben, aber da kann ja niemand was dafür. Wohnküche, Bad, Schlafzimmer, Terrasse alles gut bis sehr gut. Etwas überrascht waren wir, dass Wohnküche und Schlafzimmer keine Verbindungstür haben (Zugang jeweils nur von der Terrasse). Und die Balkenhöhen sind für Menschen > 175 cm zum Teil etwas niedrig. Auf jeden Fall weiter zu empfehlen, wenn man nicht dringend sommerliches Wetter braucht.